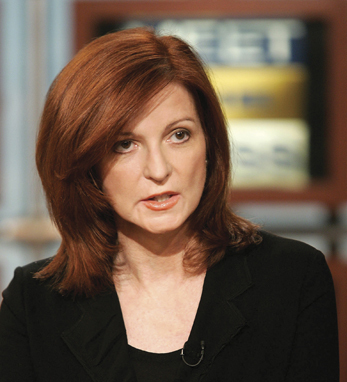 Maureen Dowd is the winner of the 1999 Pulitzer Prize for distinguished commentary and author of two New York Times best sellers, including Are Men Necessary? She became an op-ed columnist for the Times in 1995 where she writes about American politics, popular culture, and international affairs, and in August 2014, she also became a writer for the Sunday Times Magazine. Maureen’s father Michael was the son of a poor farmer in Co. Clare who had booked a place on the Titanic in 1914. Apparently his mother cried all night before his departure, and he couldn’t bear to leave her. The woman who took his place survived, and eventually met his children years later. Maureen’s mother, Peggy Meenehan, was a barkeeper’s daughter and both she and Michael (who later did emigrate) were champion Irish step dancers. In addition to the New York Times, Maureen has written for GQ, Vanity Fair, Rolling Stone, the New Republic, Mademoiselle, Sports Illustrated and others. Her column appears every Sunday. Maureen’s first experience with the press, however, was in 1954, at age two, when she appeared in the Washington Post wearing a shamrock dress on St. Patrick’s Day.